I'm not 100% sold on the wooden stair case as it is, but I like the idea. I did a recolour a while ago. Having everything be the same colour would look boring very quickly. 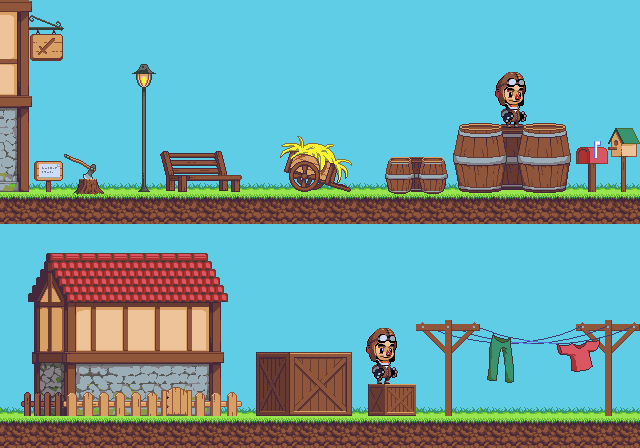 Clearly recolours should be done once the main assets are done and agreed on, but I wanted get a sense of what can be. EDit: I also wanted to look at the windows again, but only the glass, they're all very dark and don't seem to make much sense lighting wise. Not that I've done any better. I believe I'm done with this now. you are right, the stair case isn't good and it will be hard to make a interactive stair case because the angle of the stairs have to match the angle of the house. Our player position is facing to us, its animation will not match the stairs angle. @Damian, I am not satisfied with the window reflection color, I've tried other colors but it simply doesn't looks good. Maybe after deciding a better background we can choose better. @ Melenke, I tried the way owl boy did their windows, with reflections of clouds, but I just couldn't make it work :/ We'll get there eventually. 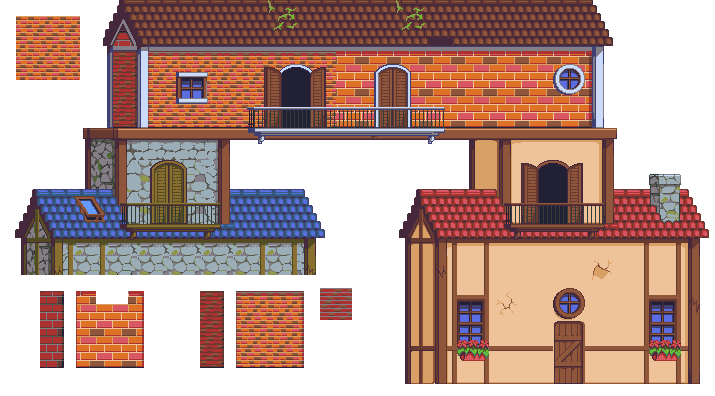 This is an edit of the tileset, but very unfinished. I just wanted your thoughts before I do anymore. I tried to fix a few things where we lacked volume or lighting didn't make sense. 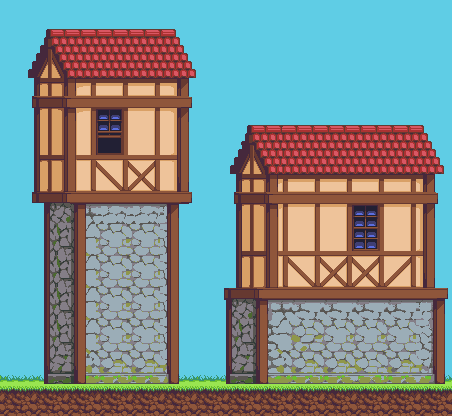 Most of the changes I made are on the stone buildings, also one of the circular windows and lastly the chimney. It's all looking pretty fantastic to me. One thing I'd suggest would be to fill the missing shingle patches with a lighter color to suggest structure underneath the shingles. 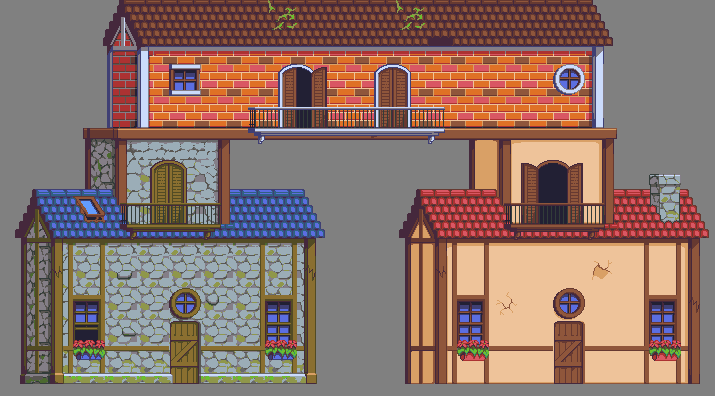 I'll also take a stab at the windows here and see if I can puzzle it out. It is a little bit weird, also the pink light in the roof is strange for me. Kinda doodled the hard shadow in, forgot I left it there. But yeah, I agree. Here's a quick edit to your crates melanke. I was thinking a pine wood look might look nice. I played around with street lamps today. Yes, the forum is a barrier which we had intended to get rid off some day. Finally had the time to look into the bricks! As I was working I realized how much of a great job you did! Well organized, beautiful windows & balcony, everything works great together! I liked the big bricks, it add some style, but I have to admit, your version of the brick wall makes more sense, since our characters are really small, but there is some bricks with smaller width that is frustrating me hahaha and I don't think the diagonal lines of brown bricks are necessary, we could spare more, randomize more the position of the bricks. I hope it's alright to chime in with some critique even though I'm not participating! The beams and bricks on the sides of the buildings are too big. Perspective should make them appear quite narrow, so them being as wide as they are makes the buildings all look like they're very narrow. 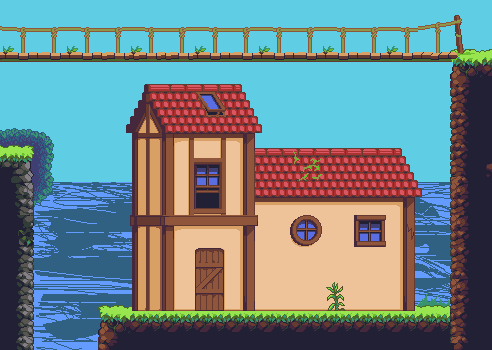 I was thinking the roof tile vines could be more cartoony and colorful. The orange wall was a great idea. Of course, all help is welcome! Yes you are right about the bricks! As for the beams, they seem alright to me but that might be subjective. @Melanke, could you demonstrate the purpose of the off-set repeated tiles? As for tiles with holes, like the round ones for the round windows, I don't think they are neccesary as anyone can overlap tiles.. The same goes for the doors with the missing lower corner perhaps.. What do you guys think? I love your flower and vines! Maybe a little more of vines in the same style would be good too, so the flower would not be too repetitive. The circular hole and the door hole are there just for the shadow, I believe that the circular hole is unnecessary, we can get rid of it, but the door makes a big difference. Ah sorry, I meant the hole in the corner of the door itself, which is overlapped by the baseboard of the buildings. The hole in the wall for the doors makes sense indeed! 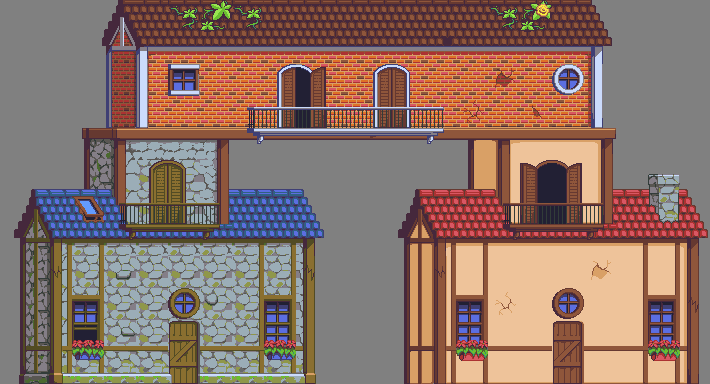 What about the offset tiles? 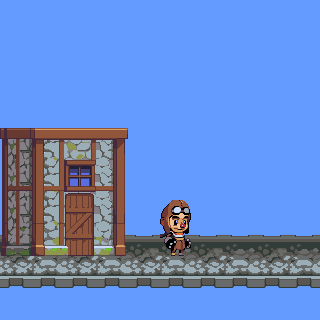 Is because now the door can be in a layer above the wall, I think it's easier to work with. by "Offset tiles" you mean the walls below? The walls on top are for the roof shadow, the walls below are for the beams shadow. Yes, but also all the bars/frames appear double, and so do the roofs! This should cover it now. 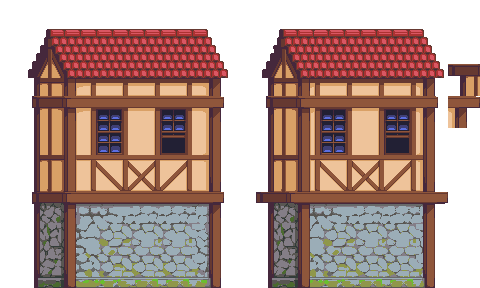 I've noticed you changed the bricks :p. Not to my liking, especially on the shadow side the gray lines bother me a lot! Which worries me in general, and has done so before: How to pick the best variant as a community, without insulting creators of either version? Sometimes I worry about this too, but I think we have to not be jealous, I really prefer the big bricks but for the good of the project I accepted the small bricks, Harmonica made better versions of outside elements that I originally made, I got a little jealous, but it happens hahahaha I want you to change my art, and I will change yours too!! So, here's a sidewalk design I've been working on. I believe it's more in line with the previous ground tiles. Oh yeah, that looking a lot better. Very clean and definitely going in the right direction. It's taken me a while, but I finally updated and structured the village set. What have you changed? Did you removed some variations (vines and cracks)? 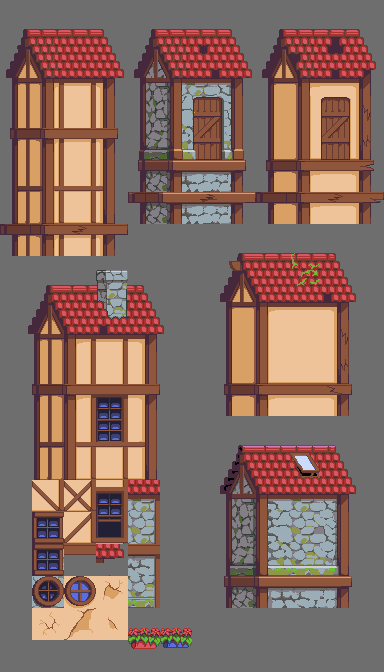 In the process of restructuring aaaallll old tilesets, I've also removed some tiles which Damian, Noburo and me didn't consider to match the rest of the set. Although variation is cool, they didn't seem to fit in very well and didn't reflect the quality of the rest of the tiles. 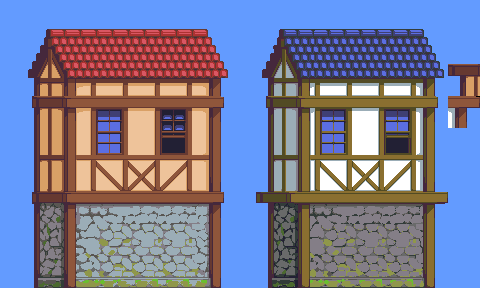 I've removed the vines, redid the roof tiles, stripped appart some of the horizontal bars from the vertical bars to make less duplicate tiles, removed the duplicate house which was moved a couple pixels sideways and the matching roof (it would take a developer 2 seconds to add the house on a 16px grid and recreate the structures in the mockups with the current tiles), stripped the roof objects from their base tiles so that they can be reused on any color roof, removed some unnecessary tiles such as the hole for the round window. 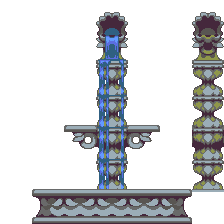 Also, I came across some stairs in a previous version of these tiles, they seemed too unfinished to add in but did look very interesting. Would you consider finishing those some day? A loooot of updates are coming up soon, mostly on the organization side, but we've met up in person last weekend to get some things straight and will be kicking stuff in action again, glad to see you're still around! The other things you removed I agree that wasn't necessary. About the stairs, IDK, it would be impossible for the character to take that stairs without a new animation, and it faces the other way, maybe we could figure out another approach. It's great that we are improving on organization, that is something we needed.